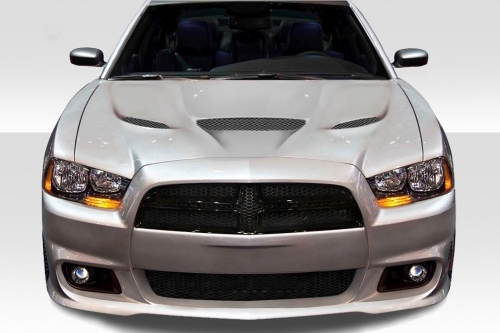 Duraflex Hellcat Style Hood 11-14 Dodge Charger Duraflex Hellcat Style Hood 11-14 Dodge Charger, Extreme Dimensions 113200 Charger Hood, Dodge Charger Hellcat Style Hood, Dodge Charger Duraflex Hood, Dodge Charger Duraflex Hellcat Style Hood, Dodge Charger Custom Hood, Dodge Charger Duraflex Hood, [Extreme Dimensions 113200 Hood] - $439.95 : 3rd Strike Performance, Your Source for Late Model MOPAR Performance Parts and Accessories! Extreme Dimensions, who makes the Duraflex line of products, is one of the elite brands that we dub a "Premium Brand" in our online catalog. To earn this distinction, a manufacturer must make products that exhibit cutting edge technology, attention to detail, and widespread popularity. Extreme Dimensions easily earns this distinction from our perspective. Extreme Dimensions, who developed the world-famous Duraflex line of products, is one of the largest aerodynamics manufacturers in the world and exhibits total professionalism in all facets of their business. If you buy an Extreme Dimensions product, you can expect a premium product. Helps to elevate your Chrysler above the rest! Extreme Dimensions is the exclusive manufacturer of the Duraflex line of products. Duraflex is a new hybrid composite material that Extreme Dimensions created that offers outstanding durability. If you are looking for a high quality custom hood, look no further than Extreme Dimensions. Note: Sanded, primed or altered parts are non-returnable. All hoods ship truck freight. Hoods are normally shipped to a business address or freight terminal. These are deliverable to a residential address for additional cost. Freight charges are non-refundable. AVAILABILITY: Ships direct from the manufacturer: Usually delivered in 2-3 Weeks, depending on shipping location. Note: For safety purposes hood pins are required for ALL aftermarket hoods. Upon receiving the hood please be sure to inspect the item for "freight damage". If there are signs of freight damage you must refuse the item, then contact us immediately. Once we verify the freight damage with the carrier a replacement item will be shipped. This process usually takes about 5-10 business days. It is the customer's responsibility to inspect the item. The two most common signs of freight damage are holes punctured by a fork lift or it's being dropped by the driver causing the corner to break off.